Chargers star Eric Weddle has a not-so-secret admirer in Steelers coach Mike Tomlin. Mike Tomlin can't hide his man-crush on a certain Chargers safety. 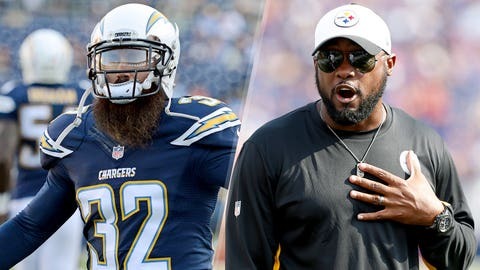 Then again, Steelers head coach does have an affinity for guys like Eric Weddle after coaching the position for years. It's been a bit of a down year for No. 32, though. Weddle hasn't been the surefire tackler he's been in the past. Whiffs against Lions' rookie Ameer Abdullah and Vikings star Adrian Peterson are uncharacteristic. Tomlin doesn't see that when he turns the game film on. Instead, he sees Weddle lining up at nearly every spot on the field on Sundays. “He's so versatile,” he said. “He's a sub-package linebacker. He plays strong safety, he plays free safety, he plays half field, he plays the middle of field. He defends people man to man. They blitz him.